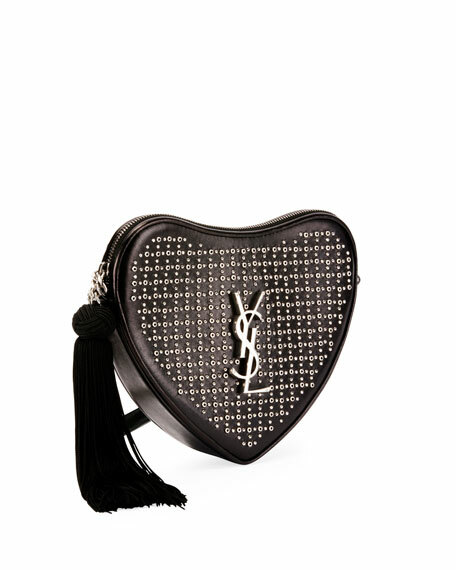 Saint Laurent heart-shaped crossbody bag in eyelet studded calf leather. 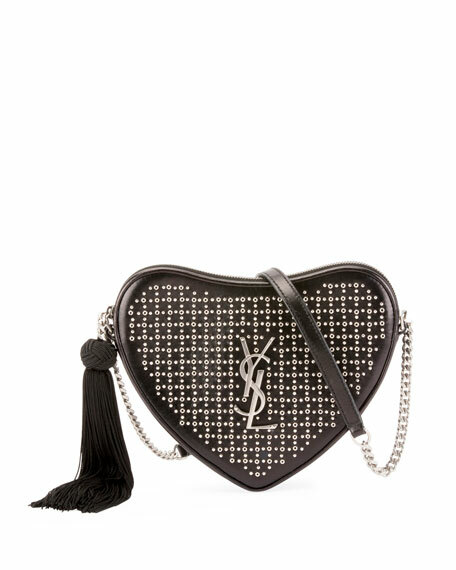 Signature metal YSL logo at center front. Chain and leather shoulder strap, 21.7" drop. Approx. 8.2" round x 2"D.
"Sac Coeur" is made in Italy. Chloe calfskin bag with tonal topstitching. Golden hardware. Adjustable crossbody strap; approx. 20" drop. Pintucked, horseshoe flap top with ring and tassel details. Flap covers slit pocket. Interior, fabric lining; small open pocket. 6"H x 7"W x 3.5"D. Bag weighs 11 oz. Made in Spain. Coach 1941 crossbody bag in signature patchwork canvas, suede, leather and snakeskin. Removable, adjustable shoulder strap with hanging logo tag, 22" drop. Framed top with kiss-lock closure. 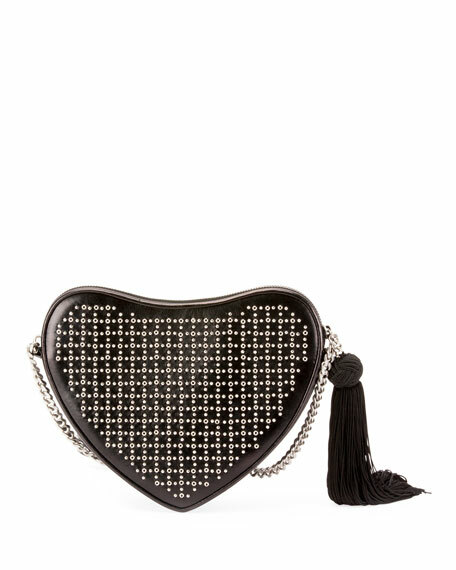 Exterior, front kiss-lock pocket; hanging chain detail. Interior, leather lining; one slip pocket. 7.5"H x 11.5"W x 4.3"D. Imported. Eric Javits "Bali" crossbody bag in signature Squishee® material—man-made fibers that are woven to resemble raffia but are more lightweight, flexible, and durable. Finished with leather trim and pompom/tassel ornament. Adjustable leather crossbody strap. Zip top. Inside, fabric lining; three pockets. Approx. 9" round. Imported.